A sarcoma is a type of cancer that develops from certain tissues, like bone or muscle. 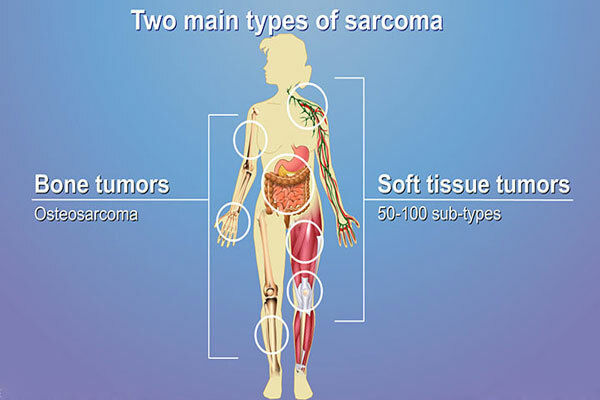 Bone and soft tissue sarcomas are the main types of sarcoma. Soft tissue sarcomas can develop from soft tissues like fat, muscle, nerves, fibrous tissues, blood vessels, or deep skin tissues. They can be found in any part of the body. Most of them develop in the arms or legs. They can also be found in the trunk, head and neck area, internal organs, and the area in back of the abdominal cavity (known as the retroperitoneum). Family history of kidney cancer: People with a family member who had kidney cancer have a slightly increased risk of the disease. Also, certain conditions that run in families can increase the risk of kidney cancer.